It's only the 2nd day of school and we are trying to ease into a new schedule after almost 3 months of school break. Fortunately for us, waking up early when needed is not too much of an ordeal. My alarm is set to go off at 515 am but so far I have been waking up 30 minutes ahead of schedule. Oh well... nothing wrong with being an early riser, I guess. The kids are ready by 6-615 am. This morning, as we were having breakfast, my Ma and Pa joined us. They got up earlier than usual so they could ride with me to the park for a short hike. And so after bringing my boys to the carpool stop, we proceeded to the park. 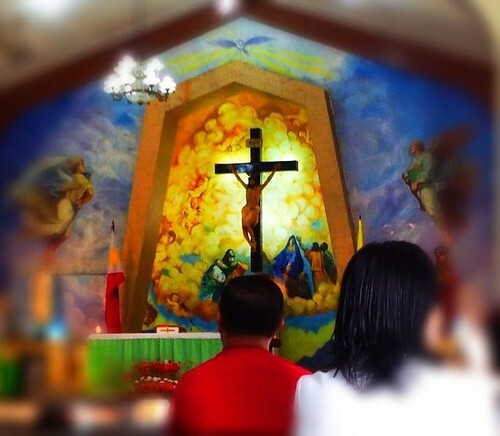 While I waited, I was able to attend mass. By 7 am, we were on our way home. During the drive back, as Pa, Ma and I chattered, I couldn't help thinking, this could be a good routine to have.